The Friendly Chain is a handsome chain based upon older Swedish models. The wide and flat rings allows for a larger contact area. 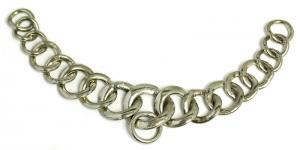 When you purchase a bit, a standard curb chain is always included in the same color as the bits shanks, but you can also purchase the curb chains separately in other colors. The Friendly chain has to be purchased separately. Available in black, stainless or brass.